Mt. 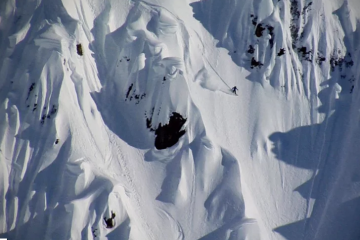 Lawrence Grassi Couloir from Rob Hopkins on Vimeo. This line has been staring me in the face every morning when I wake up and every night before I go to sleep for the last three months… I can see it from my bedroom window… It’s been almost hypnotizing seeing the upper half of this line every day for the past three months, wondering if the lower half, obscured behind a one hundred meter cliff, actually held snow or if it just cliffed out entirely. One day I couldn’t take it anymore and went for a hike with some binoculars to get a better view of it. I could see that it very much was ride-able, and it had probably been ridden many times given how easily it could be accessed from Town Gully (later that week I stumbled across Andrew Wexler’s blog post from several years before that described riding the line: http://www.globalalpine.com/2011/05/skiing-mt-lawrence-grassi-couloir.html. It was time to put this on the list! After getting sandbagged by suncrust on our last two bigger missions, Mike and I were looking for something a little less committing and a lot more North facing, and given that on this particular Sunday we had to be back in Calgary for a birthday dinner at 5pm we needed a quick fix – this little fella fit the bill perfectly! After a quick 1.5 hour hike up the approach trail we crested the last rise above Town Gully (aka Miner’s Gully aka Canmore Couloir etc. ), and to our dismay we found that it was a complete mess – frozen avi debris, pinwheels the size of exercise balls, and troughs through the snow from previous wet point releases made it a pretty awful ride. Well that’s a bad sign. I was worried Mike would never want to come out with me again – I seem to be a magnet for bulletproof suncrusts and flat light… Luckily the snow drastically improved after Town Gully and we found ourselves bootpacking through knee-deep powder all the way up our line. The beautifully consistent and heavy, but not too heavy, powder made for difficult bootpacking but an incredible lack of reactivity – I have never felt this confident in a snowpack in the Rocky Mountains, ever. This felt like the stability you would only find West of Lake Louise….